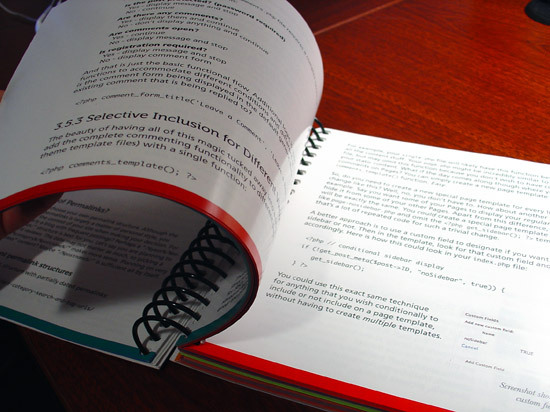 Throughout the book, chapters and sub-chapters are clearly defined and easy to recognize. Each page is presented with a variety of content, techniques, graphics, boxouts, side notes, and lots of fun. Plus plenty of white space helps to keep things relaxed and focused along the way. 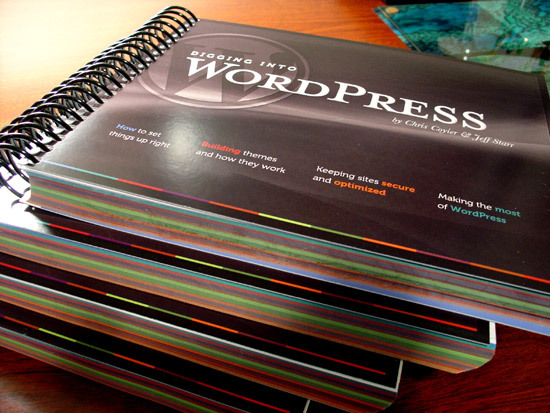 Design-wise, Digging into WordPress is a beautiful book: every page is printed with stunning digital-color precision on gloss-finish paper, with each of its 12 chapters color-coded to provide quick and easy navigation. With its large, clear typography, each page is a pleasure to read. The books are priced at $75 + shipping/handling (around $8 within the US). This includes tracking, insurance, and delivery confirmation. As with previous editions, we have a limited number of books and they may go quickly, so grab it now if you want one of your own. After purchase, you get access to the DiW Members Area, where you can download current versions of everything at your convenience. There you may also grab a copy of the Deluxe Widescreen Edition, plus other goodies as we make them available. Questions? – We strive for stellar customer service, so feel free to contact us anytime with comments or questions. Contact us and we'll do our best to help. The most unique thing I’ve done with WordPress would have to be turning it into a WYSIWYG editor. I essentially just used ajax to get the page content and the appropriate section of the stylesheet and then used jquery to inject it into the back end and to add the editing capabilities to it. Try to teach undergrads how to pimp their blogs. Put online a website in 2 days for a boss that didn’t have a clear idea of the new business unit he was trying to market with the mentioned site x_X… Thanks to WP and its flexibility, it turned out OK :) (well, obviously it took more than a couple of months to give it its final shape, but WP saved the day). The most interesting thing I’ve done with WordPress so far would have been turning it into a public site with a secured paid membership area. I learned a lot in the process of doing that but I know there is still much MUCH more for me to learn! I like the cover and how it was printed. Awesome! 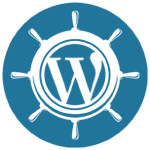 The most interesting I’ve done in WordPress is when I tried to used WordPress itself as a blog and CMS. That’s it! WordPress is fun, challenging and nail bitting (hehehe) experience. Thinking how the site come up, structure, flexibility, easy to use and more. And also, I would like to experiment about multiple sites in wordpress in the future. Still learning wordpress. 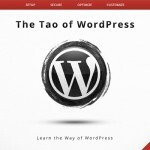 So most unique/interesting things which I’ve done with wordpress is still in the queue. :'( .. BTW nice print great books, would like to buy one. The most unique thing I’v done with wordpress was code snippet site. Each snippet was basiclly a post, and using contact form 7 and the feature of adding posts through email, I’v added an option to the users to add their own snippet. It was pretty interesting project. If the shipping price was not so expensive I would have buy it. $45 for shipping a BOOK to Greece is freaking expensive :). Anyway, maybe I’m lucky to get a free copy :). So, the most interesting thing I’ve done in WordPress is to create some landing pages for some products and everyone didn’t believe me that I’ve accomplished it with WP. The most interesting I have done so far is to take the challenge to rebuild my php only site to a full featured WP site… it could be hard but I have sure learned a lot from the eBook. Since I’m fairly new to WordPress the most interesting thing I’ve done was start to understand php by breaking WordPress over and over. Rookie here so have only began to mess with WordPress. Working on creating a Website with is using WordPress as the CMS. Most interesting thing I have done with WordPress is built a custom post type so a baseball club could keep the teams data and accessible to every player/member. I made a blog… for my mom… and she uses it! Weird. Most interesting thing I’ve done with wordpress? Get paid, and made a client happy – i hope! Still plenty yet for me to learn though, and this book would help me greatly in doing so. 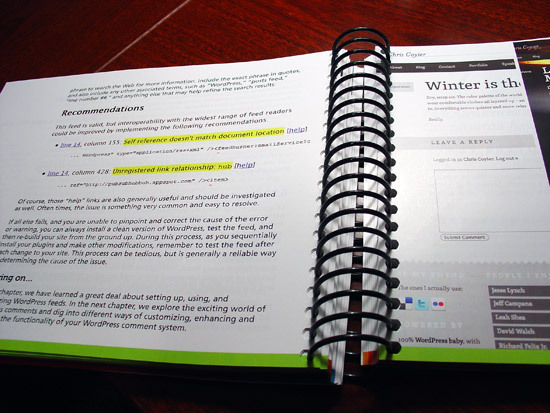 I love DigWP book and would definitely love a hard copy. I do agree with you on the customer service, your service is amazing. Great job and keep up the good work. So the as I am a newbie to WP the most interesting thing I’ve done with WP is built a site/blog for a wedding cake designer. Don’t have a job right now, but once I get one, I’ll buy if any are in stock. 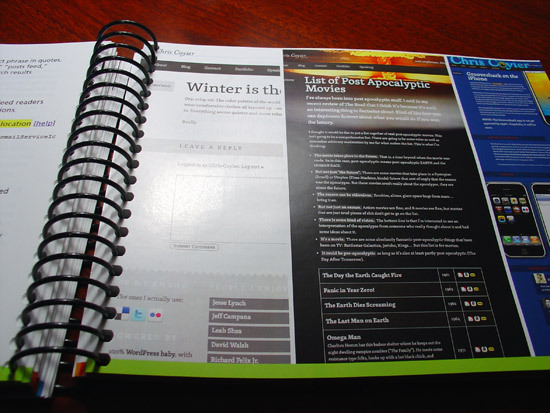 I’ve got the pdf of the early version and printed it but (as a designer) I would love to have the actual book. 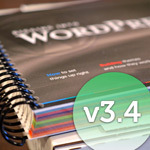 I am working with WP now for 2 months after and must say I love it. Most interested thing I’ve done with wordpress: I set up the website of my sons company in WP although I already had build in static html. And it was no waste of time! Made a complete Celebrity directory using custom post types and custom taxonomies, including photos galleries, videos galleries and much more. 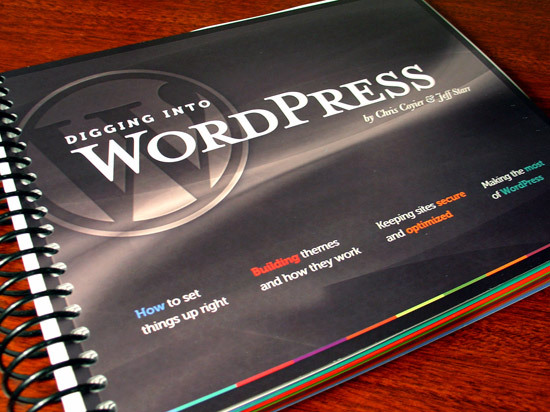 Having this book would help me get better understanding the backend of wordpress and I would love to learn more about creating plugins. Like the new eBook layout. Awesome! The most interesting I have done so far is to take the challenge to rebuild my php based client’s website to a full featured WordPress site… it could be hard but I have sure learned a lot from the eBook. I learned a lot in the process of doing that but I know there is still much MUCH more for me to learn! I’ve used WordPress to show senior citizens that they can actually run a business or stay connected online. I love how WordPress evolves each year so that what I need is magically available. Thanks to you guys for explaining it sooo well. Chris.. I took your course over at Lynda.com and love your teaching style, it just “clicked” with me. It’s a great course and I highly recommend it for anyone who hasn’t taken it. Thanks for the chance to win one of your awesome books! Currently finishing up revisions (fingers crossed for a launch next week) to a 100-page website for a non-profit website done entirely in WordPress. I was successfully able to create the site using CSS3 mega drop down menus paired with WordPress menus. Overall I’m very happy with the end result. If you want to see the development link – please send me an email. My boss was blown away by the results. He originally said we should opt for something other than WordPress – because of WP’s limitations. I proved that WordPress was just as equally capable (if not better) to use than any other CMS system out there. As my project list continues to grow – and I’d like to continue learning some of the more advanced features of WordPress. With an active online community, vast array of plugins and the easy-breezy dashboard system – it makes it ideal for almost every project. I want to push the boundaries of WP development for future projects. Cool stuff! The most interesting thing I’ve done with WordPress is create a basic ecommerce site. Sold some t-shirts, but I quickly killed it off. I haven’t done a damned interesting thing with WordPress at all. I’m an ex-noob graduating to semi-advanced noob, and managed to get WP onto part of my existing site, and wow-wee I changed a header and some colors in the CSS, but I want to convert the whole static site over to WP as well as redesign the entire damned thing. So I’m getting the book. Looks like a beaut. Thanks guys!! the most interesting thing i did on wordpress is: configure / customize wordpress as backend of a intranet groupware. There are 4 different application communicate with wordpress through DB and REST. 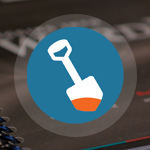 The most interesting thing I’ve done with WP is a blog of our company. Most interesting thing I have done with WP is that, I have created my company website which is already running in core php, and I have just created that in just 5 days in with WP. I build websites primarily in WP. Everything from Real Estate to Healthcare to Education to State sites. I love the flexibility of WP. I find it much easier to use for a client CMS than Joomla! — the other platform I work with. The most unique things I’ve done with WordPress is adding extra widget on the place that I want it to be, and of course modifying the costume menu! I made a membership site that can also be used to email the members about the next newsletter update. The newsletter was created to use 8 editable content blocks so that it would be like their previous site; it’s pretty easy for them to use. Most interesting thing that I’ve done with WordPress lately is to consider using it for a Newsletter Generator – it’s so flexible, I figure why not? Nice work has been done! Beautiful book and very useful. Want to have it on my bookshelf. Just wanted to let you know I received the book this week. It’s gorgeous!! Thanks again guys, and I’ll be going to work on my site redesign. Has the book been helpful for a beginner…. I’m thinking of getting it. The most interesting thing I have done with wordpress is try to get it to mate with Moodle! It seems like that would be much easier than learning how to take the best of both world and combine good education and visually appealing web design.